I think it was my best friend Julie when she left our house last Saturday after dinner. A trick....huh? Well a cheap way to reduce eye puffiness is to use Preparation H cream on your under eye area. You can put the tube in the refrigerator for added benefit. Don't get the gooey salve stuff, make sure it's the cream. Sounds funny but it works. I think it'd revolve around people and their faces. I love older people and their faces tell a story. Well it's a series, but it'd have to be the Outlander series by Diana Gabaldon, each book, in paperbook when I originally read it is huge...a big book but surprisingly they are easy to get thru because you get lost in the story. I radiate warmth and love to everyone I meet today. I saw this on Very Pink and I had to give it a try. How come I didn't get some celebrity great like Liz Taylor?...lol. I guess I like that Famke Jannsen came up. But I do not know who Lalaine or Camilla Belle or Delta Goodrem is. Try it and if you do, please leave a comment for me so I can go see who comes up for you. It's free, so go ahead, try it! I am capable and worthy of clarity, insight, and peace of mind. I think I've recovered from the dinner party. It was a lot of work, but it was a lot of fun and the best part is that now the house is nice and clean! Oh, there are still areas to work on, but it's much nicer now that we cleaned and organized and threw out a bunch of crap. How it's possible to collect so much stuff is beyond me. It's a constant problem. And I really need to work on my organization of my yarn stash. That's not going away anytime soon and seems to keep growing. It was my guy's special milestone Birthday yesterday! I wasn't able to spend time with him but I know he had a good birthday. If you are questioning who my guy is, because I was recently going to date that loser that didn't work out, and now I have a guy, well, he's the same guy whom I met over a year ago. 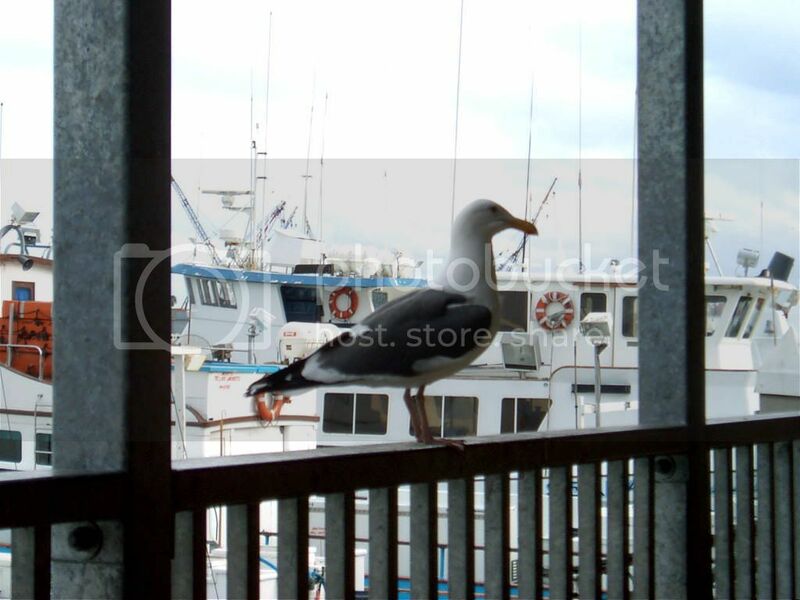 The one who flew out to meet me in person. We met on eharmony. We've been up and down, it's been a long journey, but we are back on and I'm happy about it! I had a facial and microdermabrasion last week! I've never had microderm before and it was really cool. Very pampering. I found this great place and all they do is skin care. The microderm really did improve my skin, especially since I now have clear skin thanks to Proactiv. And it didn't irritate my skin like it sounds like it would. They warned me that I may break out because of the deep cleaning but I've had none of that. Top Chef Season 4 is starting Mar 12! Yee! I love that show. I hope we have some real talent this time and not so many stupid stunts this time around. And I hope Padma cools it...she's a little hard to take sometimes. That accent of hers can get to be like nails on a chalkboard after awhile. Or is it just me? Or is it because I'm a woman and all the men just drool over her? She is pretty, I'll give her that. I started another pair of Firestarters with KPPPM Koigu and wait til you see the colors! I LOVE IT! Here is Julie, Sandy, Mamacita and me. Sandy and Bob. Gosh I'll miss them. I think the dinner was a success. The table was beautiful. Springy and pretty but also with a touch of class. We used Mamacita's beautiful Rosenthal china and my Wallace Silverware. The salad was the best part for me. I loved the combination of the vinaigrette dressing I made which was kind of light with a small tang from the white wine vinegar and the dijon mustard and then the candied pecans and the bleu cheese. Everyone seemed to really enjoy it. The candied carrots Mamacita made were fabulous, the tenderloin was OK. Well everyone seemed to really enjoy it, but I was very critical and what I didn't like was the fact that I didn't get the quality I wanted in the beef tenderloin or the lobster. The tenderloin wasn't trimmed properly and the way it was butterflied made it a little hard to wrap and tie. And then the bearnaise sauce, well it curdled and I was terribly disappointed. The only difference was that the eggs were taken from the fridge and were cold and I think they should have been room temperature. Anyway, I was really upset about it but they all said the taste was still there and they ate it all anyway. The dessert as always was fabulous. I had a small piece but the remainder was given to Julie because Mamacita and I didn't want the leftovers. Sandy and Bob are moving to VA. They brought pics of their new house and it's just lovely! Gosh, she's been such a great friend to me. Julie and I plan to visit VA as soon as possible, maybe this fall. 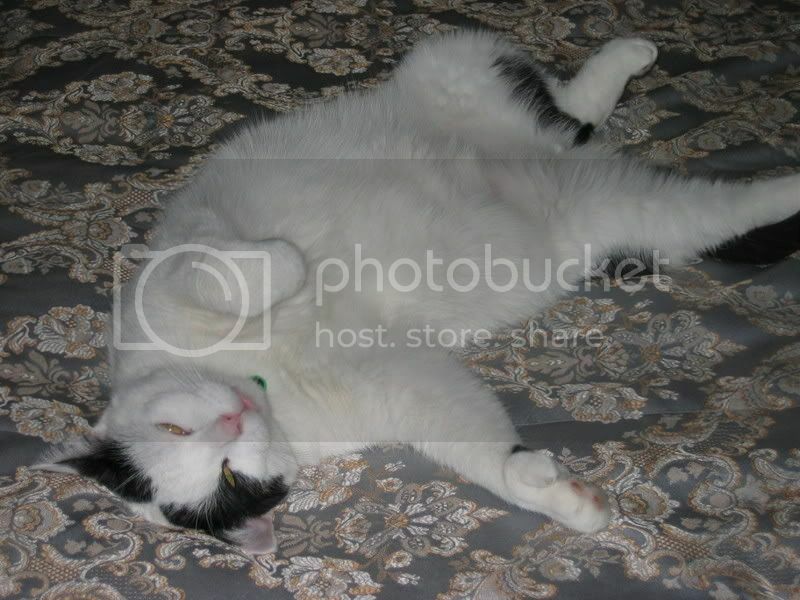 This morning I have a headache (perhaps a bit too much wine?...) and my body is feeling the affects of running all day. I'm sure I have, probably to one of my family members, but I can't remember the last time. We have Princess House S&P Shakers that are older than dirt, you cannot even buy them anymore. The ones they have now have a different odd shape. My best friend and I are thinking of going to the East Coast this Fall. To Maine and Vermont, but now we have a friend moving to VA, so we may go there too. I am constantly putting lotion on my hands at work. I have L'Occitane Dry Skin Hand Cream, Badger Foot Balm which I use on my cuticles, Vera Wang Silkening Hand Creme, Avon Vita Moist, Time & Again Shea Butter in Pink Poinsettia and Johnson's baby oil gel. That's just on my work desk! It's a favorite snack of mine. I'm just so excited because this has never happened to me before in almost 3 years of blogging! I...Miss Mitchypoo!! 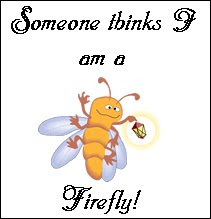 !....have been awarded a Firefly Blog Award!!! It's from the lovely Amy Shipp and I'm just thrilled! Thank you Amy! Not sure what I'm suppose to do, but I think I'll keep it posted for awhile and then I'll award it to someone else. The more open I am, the safer I feel. I have a dilemma and wondered what you would do. There is a guy at a shoe company I just frequented and later I had to return these boots. Well he's young and hip looking, probably early 20's or possibly like 18 or 19, I don't know. He dresses kind of hip, in style. But....he has really awful acne. Just awful, like it looks like it hurts and it's inflamed and he looks like he wears foundation to cover it. Like he actually wears a lot of cover up or cream base, I don't know but you can tell he wears makeup. And I just feel so awful for him. 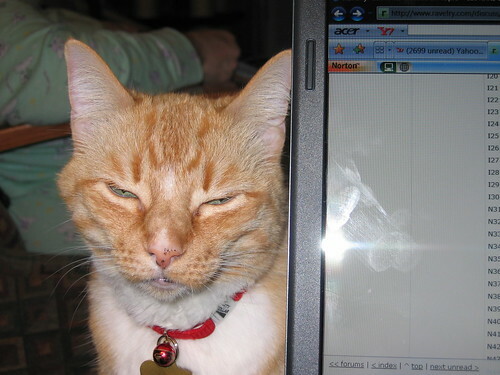 He has that look like he won't quite look you in the eyes, because he doesn't want you to see him. And I recognize this, because I may not have had acne this bad, but at some points it's been pretty bad, red and hurting and inflamed and I know that look. So my question is, if I were to buy him a set of Proactiv, would it be totally rude to give it to him? And if I do do this is there a way to do it so it doesn't embarrass him? I've had that problem too. Once I went in the local corner mart and there was this new owner, this was like almost 20 years ago, and this witch had the nerve to say something to me about some products she was peddling and how it'd help me. I remember being terribly embarrassed, there were other customers around and I wanted to just scream to her....I just came in for some milk, you beyotch! I felt it wasn't her place to say anything to me and it irked me to no end. But I still want to help this guy. I just cannot imagine that it wouldn't help him and it's so worth it and truly not so expensive. I'm thinking of getting it and putting it in a bag and then just going in there and giving it to him and saying I don't want to embarrass you but I wanted you to have this. And leaving. And I can put a note in there saying why I gave it to him and how it's helped me. Would you? How would you handle it? Self-compassion is a vitamin that feeds me constantly. Had a nice and relaxing weekend and got quite a bit done at the house. I'm having a dinner party next weekend for a dear friend who is moving to VA next month with her dear hubby. They had plans to retire out east and they found this fabulous house and so it's all happening very fast, but my dear Sandy will be far away. But now I have another reason to visit the east or south (to me it's the east coast, but it's also called the south, I'm confused) which I've never been to. I've only been to Florida for one night to board a cruise where we went to the Caribbean. Mamacita and I met Friday night for a drink at a hotel where she sometimes meets a group of older widowed women. She hadn't been to join them for awhile and maybe they found another place because nobody else showed. So we finished our glass of cabernet and then drove to a bbq place to have some dinner. We had a really good dinner, I had a chopped salad with portabello mushroom and Mamacita had the baby back ribs, we shared and it was yummy. Gary did not come home this weekend so we had a little more free time. Yesterday we went to the beach and did some shopping on the main street of Belmont Shore. A nice little community where there are really cute shops, some artsy places, gift shops, a shoe store that the owners have had for 60 years. The weather was perfect, sunny, with a cool breeze. Then we drove down to Seal Beach and had a late lunch at Walt's Wharf which has really good seafood. We both had the clam chowder and Walt's Special Salad which was yummy. They have fabulous sourdough bread too. It was also a martini lunch as we were celebrating what would have been my Father's birthday! Mamacita had a Mango Martini and I had a Fig & Pomegranite Martini, Yum! Here is my finished Fair Rosamund Tam. 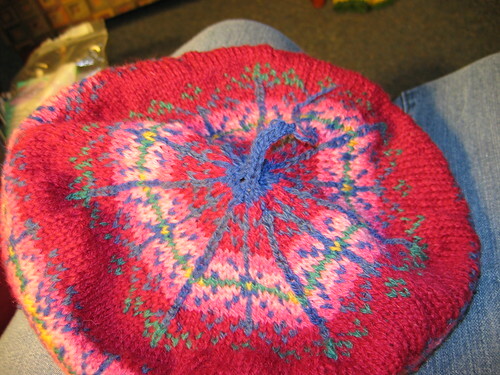 I loved knitting this, doing Fair Isle or colorwork is very satisfying and a nice break after doing socks. I cannot wait to start the cardigan that goes with this, but I'm reluctant to start because I want to get some more socks done. But now I feel a little more comfortable knitting Fair Isle and so I'm not intimidated to do a whole cardigan. 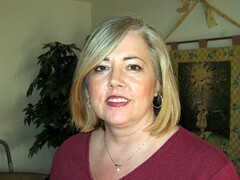 Here is a link to the designers page of patterns for Twisted Traditions. I love her patterns and she's nice too. Lipstick worn today: Chanel Rouge Allure in Attitude ~ a favorite color of mine. Perfume worn today: Angel by Thierry Mueller ~ it was a tester I have and honestly, it is not my favorite. It's a little spicy and just feels off for me. I'll have to throw that one away. 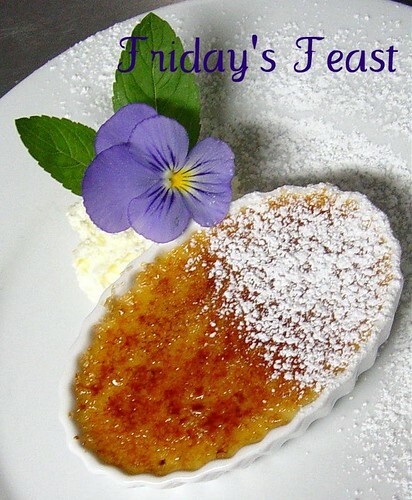 There is no official Friday's Feast posting. They are having issues, not sure what the problem is, so I've decided to do my own Friday Feast and I invite you to leave me a comment with your answers. Appetizer: What is your favorite snack food? My favorite snack food is salty chips and fattening ranch or french onion dip. Soup: If you could travel to anywhere in the world on the spur of the moment with no limitations, where would you like to wake up tomorrow? I'd like to wake up in Venice tomorrow morning. I would find great places to eat, take a gondola ride, visit art museums. 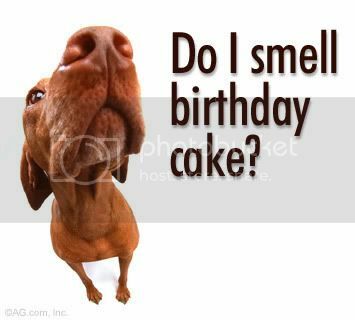 Salad: What is your favorite natural smell? Entree: If you could change only one thing on your body, what would it be and why? I'd get rid of any of the remaining bulging disc in my back so I wouldn't be limited in any movement. Dessert: What is something that calms you? Lipstick worn today: MAC Satin in Twig ~ a natural brown color. This is a very neutral color and goes with a lot of outfits. I'm wearing jeans and black today, so it's perfect. New Beauty Item I'm Using Today: Azulene Eye Treatment by Earth Science. 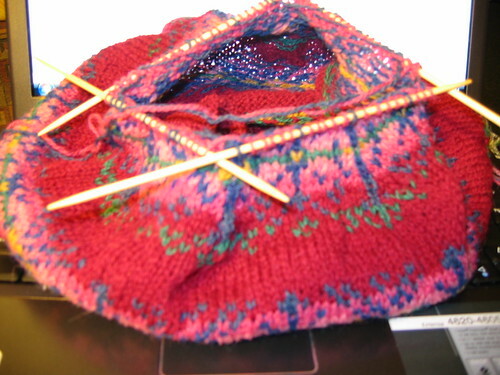 I finished the Fair Rosamund Tam last night, here's a pic of it before I finished. Wow, I love this pattern and doing Fair Isle Knitting. Very satisfying. 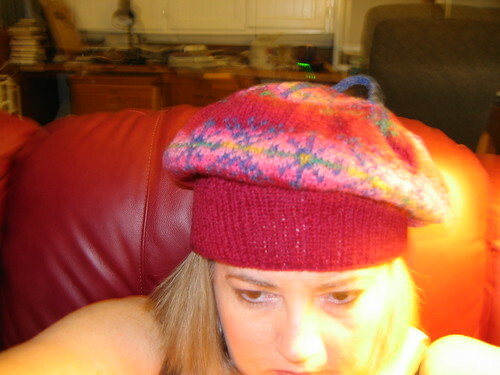 I'm itching to start the cardigan to go with this, but I may get some socks done first. I'll post finished pics tonight. I'm debating if I need to block it or not. The whole world is my valentine. Love is everywhere and my heart is open and receptive. I like the Splash of Sass part in my Michele Martini! Look what Mitchypoo received at work yesterday! Aren't they lovely! 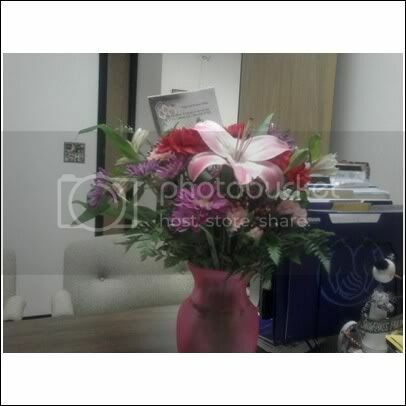 They are from my special someone in SC. It was a really nice surprise. Mamacita was observant of my weightloss efforts and gave me a lovely card and a Starbucks card! YAY! We're going to go to dinner tonight and will be each others Valentine! I hope that you feel and know that you are loved today! Perfume worn today: Truly Pink by Vera Wang ~it too is soft and romantic and reminiscent of being in a rose garden. Look what I purchased for myself! Ingenuitea! I've bought this as a gift for several people, but I ended up with no tea for Mitchypoo. I'm making an effort to drink green tea instead of coffee because of the health benefits and it's also known to help your weightloss efforts and that interests me. And I love the taste of green tea. I'm so happy I have my own Ingenuitea and 4 different varieties of green tea. I'm keeping mine at work to enjoy throughout the day. If you would like to try Adagio Tea I have in my sidebar a sign up to receive a $5 gift certificate. This is a great company and you won't receive a bunch of junk mail and spam if you try them. I got over "the non-date" and I thank you all for your comments. I did realize early that it said a lot about his character and he showed he that either he is too anxious of a guy or a demanding and controlling person. I want no part in it. They are really comfy. See the cool cable on the side of the foot and then again on the side of the leg? 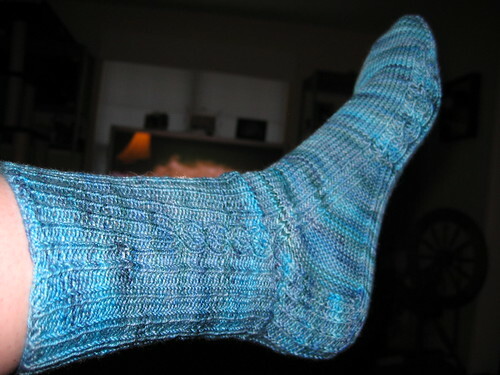 See the different gusset, I just love this pattern from Yarnissima. And I love the yarn! It's Koigu KPPPM. Must get more Koigu!! But the yarn goodness still kept arriving on my doorstep last week. Check out my yarn pr0n! And yes, that is my real nails! I can't believe how this new stuff my boss told me about strengthens my nails and allows them to grow. It's called Nailtique, Formula 2. It's a protein and somehow this stuff works! My boss told me because she's always had thin flexible puny nails but she started using this and now she actually has nails. I have pretty strong nails, but this make them really strong and hard and I can go without polish and they feel good. And you can put polish on top of it too. It's amazing stuff.. Anyway....way off track there, but I'm impressed with my nails for once. Isn't the yarn lovely too! 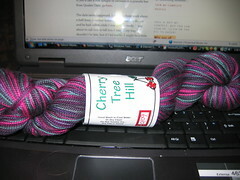 I love, love, love this yarn from Cherry Tree Hill. Love me some CTH!!! And then I got this beauty because I've never used Shibui Knits Sock yet and had to try it. 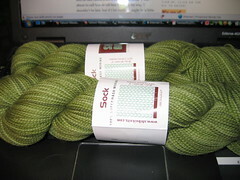 It is lovely yarn and I love this green. 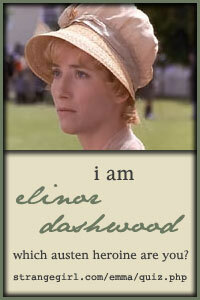 Oh, and I've also started the Fair Rosamund Tam and it's going well. Pics in the camera still. Will show you when it's complete. Maybe tonight if I stay up late. I'm having one of those Mondays. I'm behind at work, trying to catch up and things are not going well. Is it time to go home yet?? I expand my world by loving everyone. If you'd like a free sample of oatmeal or a granola bar from Quaker Oats, go here. The date never happened. I was late from work about a half hour, I rushed home and was back in the car and he had called while I was getting ready, I was about to call him to tell him I was on my way, I shouldn't be late, but if I hit traffic, I might be a little late. I reached him and told him that. He was waiting already. He called me back 1 minute later and said to forget it, he was going home and he was upset that I could be late, he said that first impressions are everything. He hung up on me. I tried to call him back to talk to him but I couldn't believe what he was doing. He turned his phone off and it went right to voice mail, I did not leave a message... Let's just say I'm really upset, but I'm glad I found out he was a jerk before even having to meet him. I probably shouldn't listen to Country Western music today at work, it sometimes makes me melancholy and I'm already on the very verge of tears. I accept opportunities when they come my way. I feel confident about my future. And I have a secret to tell......I have a date tomorrow! Good vibes, prayers....appreciated. I really want to share life with someone special. Cap'N Crunch w/Crunch Berries. But I don't buy it so I can continue to lose weight! I bought some aqua salad plates. They are in the kitchen of course. I like some of the Super Bowl commercials. I can't remember what they did though. Saffron Iguana...ewww. What a weird question. What's the point? Fill in the blank: I haven’t _wanted to fill this in_ since _I read the question_.